The 160-strong fleet operation is being managed with the BigChange 5-in-1 cloud-based platform that live connects in-cab mobile tablets to back office management software and real-time vehicle tracking. Drivers use BigChange tablets for recording their timesheets and expenses, as well as for vehicle check reports and capturing timed-stamped photographs. Clipped into dashboard mounts, the tablets provide messaging, navigation and traffic reports on the move. Vehicles are also live tracked for monitoring journeys to ensure efficient routes are used and vehicles are on time, backed up with reports on fuel consumption and driver performance. « Pollock Scotrans has embraced BigChange in all areas of the business from Driver, Vehicle and Job Management, we have seen tangible benefits and can honestly say the system is helping us streamline our 80 year old business ». 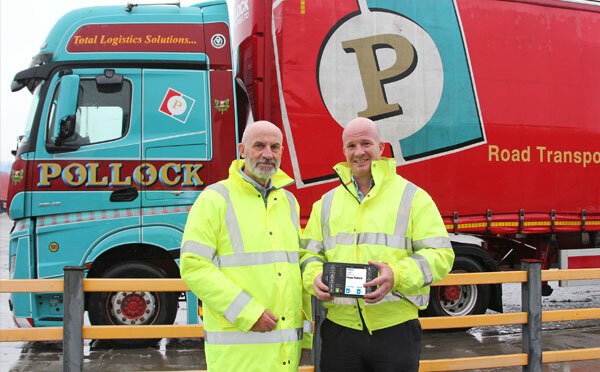 Driver performance is important for improving safety and reducing fuel consumption and BigChange has proved very useful according to Mark Jackson, Operations Director at Pollock Scotrans, who also sees the driver check app providing big benefits. « The driver check app has eliminated paperwork and ensured drivers complete inspections properly. Real-time reporting of defects including photographs means we can immediately alert the workshop about crucial defects allowing immediate scheduling for repairs ». Pollock Scotrans’ customers are benefiting directly from BigChange and already live tracking information is being sent directly to clients to monitor transport of their goods. « Integration with our customer systems will provide a significant saving in time both in creating jobs and in providing post job information, whilst also improving customer service with speed and quality of information if a query arises ». Article précédentCEO’s Blog – Shop Floor Day – Let Martin take a closer lookArticle suivantCEO’s Blog – BigChange June Motivational Monday welcomes – Bob Champion MBE is an English former jump jockey who won the 1981 Grand National on Aldaniti.